Lawrence is one of 26 “Gateway Cities” in Massachusetts, which means it is a mid-sized urban center that was once home to industry but struggled as its manufacturing jobs disappeared. Gateway cities are home to the largest numbers of English Learners (EL) in the state. In the case of Lawrence Public Schools, 71.3% of students' first language is not English. In 2015-2016, Lawrence Public Schools adopted KnowAtom’s K-8 science and engineering curriculum and hands-on resources because of KnowAtom’s success in helping other large urban districts significantly improve the science learning outcomes of all students, including EL students. 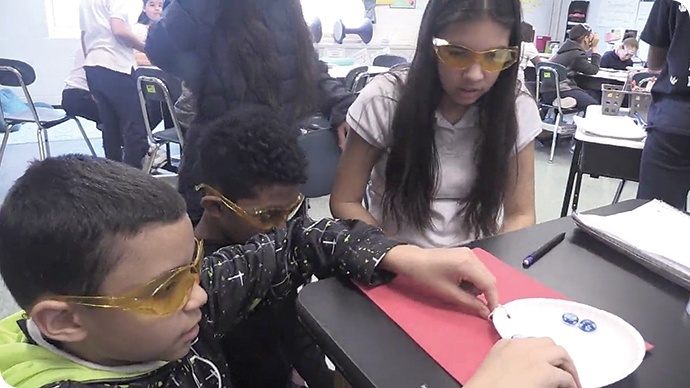 In partnership with KnowAtom, educators and administrators in Lawrence Public Schools have made significant shifts in their instructional practices and classroom culture to improve student engagement and performance on the state’s standardized science testing. Lawrence’s English Learners have moved from below average to above average performance when compared to peer districts, placing them among the top performing EL students in Massachusetts’ urban districts. Since Massachusetts began testing science, technology, and engineering statewide on the Massachusetts Comprehensive Assessment System (MCAS) in 2003, Lawrence Public Schools struggled to improve student performance. For example, in 2003, 98 percent of Grade 8 EL students and 93 percent of Grade 5 EL students scored warning on the science MCAS. Performance for the following eight years was largely flat. In 2011, 91 percent of Grade 8 EL students and 72 percent of Grade 5 EL students scored warning on the science MCAS. In November 2011, the Massachusetts Board of Elementary & Secondary Education designated Lawrence as a Level 5, or “chronically underperforming,” district, which resulted in Lawrence Public Schools entering state receivership. Jeffrey Riley was appointed as the state’s receiver. The state’s receivership of the 13,900-student district “will enable us to implement an aggressive agenda aimed at transforming Lawrence into a district where strong educational outcomes are the rule and no longer the exception,” Mitchell Chester, Massachusetts’ education commissioner at the time, said in a 2011 press release announcing the Level 5 designation. With school autonomy a key part of the Lawrence receivers’ model, school-level decision-makers including teachers, academic deans, and principals identified the limitations of their existing science curriculum, hands-on resources, and pedagogical approach. “Teach-in-any-order” units lacked cohesion and focus to support students in making sense of phenomena and designing solutions to problems. The district historically relied on resources that adapted to existing instructional practices, perpetuating instructional practices that were often no longer appropriate. Teachers’ reliance on students reading about science with hands-on components as “hooks” and culminating activities prevented a focus on empowering students to work together as scientists and engineers, engaging their own ideas in hands-on investigations to figure out phenomena. A focus on lower order thinking skills like remembering, understanding, and applying vocabulary created a barrier for EL students, preventing them from creating, evaluating, and analyzing verbally and hands-on. Front-loading vocabulary and demonstrations took the place of students’ learning how to work with their own ideas and the ideas of others across all three dimensions of the new science standards. Mastery became dependent on learning a standard the one time it was taught. This approach created a structural gap for transient students who were not present or ready the one time the standard was taught. Without standards used in supporting and reinforcing clusters throughout the year, there was limited opportunity for students in Lawrence to make meaningful connections across strands. A focus on summative assessment failed to regularly elicit direct, observable evidence of three-dimensional learning, preventing a shift from a teacher-centered model of instruction to a student-centered one. To address these concerns, Lawrence partnered with KnowAtom in the 2015-2016 school year in approximately 400 classrooms spanning K-8 to improve its students’ academic success in science. Within the first 60 days, grades 5-8 district-wide implemented KnowAtom’s cohesive, grade-specific curriculum designed for the next generation standards with units that followed a purposeful progression of storylines. A purposeful progression of storylines that clusters standards from one unit to the next and helps students perform the expectations of the standards and make connections in multiple contexts. Grade-specific curriculum progression that intentionally engages students in higher order thinking, working with their own ideas and the ideas of others across all three dimensions. An opportunity for formative assessment within each aspect of a lesson, including student investigations and labs, as well as unit concept assessments that challenge students to apply their thinking and skills across all three dimensions in a new context. All materials kitted by unit were sent directly to individual classrooms. Instructional units are designed around real phenomena that students investigate hands-on to answer questions and solve problems. Teachers no longer have to buy their own materials, wait for someone else’s kit, or organize their own live materials. KnowAtom resupplies and replaces broken components to prevent a lack of materials or tools becoming a barrier to student learning. All teachers received a new user orientation and training. Teachers learned how to empower students by switching from a traditional model of instruction to a next generation model. Teachers learned how to make thinking visible by coaching students to use their ideas as a tool to solve problems and answer questions for themselves. Teachers learned how to conduct formative assessments that provide useful feedback to students on what it means to learn well and to teachers on the effectiveness of their instructional practices. In year 2, Lawrence adopted KnowAtom’s grades K-4 curriculum district-wide. Grade-specific sessions where teachers implementing KnowAtom could ask questions and discuss challenges as they shifted to next generation instruction. Administrative sessions where principals and superintendents learned why next generation science instruction is fundamentally different, how to conduct next generation learning walks, and how to analyze a variety of student data. Teacher leader sessions where self-appointed representatives from each school building learned how to develop a culture of next generation science practice in their buildings and support their peers. Community-wide sessions where parents, teachers, principals, and other community leaders engaged in discussions and activities to understand the expectations in instruction students would experience in a next generation classroom. The core of KnowAtom’s next generation inquiry process is students investigating phenomena and designing solutions to problems hands-on. This approach ensures that regardless of their language, all students are engaged every day as scientists and engineers in the classroom. For English Learners, hands-on inquiry is an opportunity to engage with phenomena through sight, sound, smell, and touch, and work with their own ideas without needing all of the words and “background” to explain in English. Complete curriculum solution provides multiple entry points. KnowAtom’s solution includes leveled nonfiction reading, Socratic dialogue, materials for student-led scientific and engineering investigations, and both formative and summative assessments. The content is also scaffolded from unit to unit and across grade levels. This approach provides all students with multiple entry points for engaging with the material, both within a lesson, from one unit to another, and from one year to the next. This is especially important for English Learners who are improving on English language skills by anchoring new vocabulary in real-world phenomena that they lack the words to explain in their native language. Innovative online tool increases student engagement. KnowAtom’s SocraCircle® is available for web-enabled devices, and allows all students to engage in meaningful, higher order dialogue with their class in a group text format moderated by the teacher. For English Learners, this provides the opportunity to use tools such as Google Translate and spell-check. It also gives them time to form their own responses and options to engage with different threads of discussion. Formative assessments provide teachers and students with feedback in real time. English Learners are verbal first. Formative assessments, especially those in a verbal format, which KnowAtom makes possible, provide students with feedback to inform their thinking and improve their current work. This also provides teachers with insight into how their practices impact student thinking, especially English Learners who may not be able to articulate their thoughts in writing. ENLACE (Engaging Newcomers in Language and Content Education) Academy is a program at Lawrence Public Schools that serves 9th and 10th grade ELLs who have been in the U.S. for less than two years and are just beginning their English language development. ENLACE has been using KnowAtom’s 6th, 7th, and 8th grade life science curriculum since 2016. The Massachusetts Comprehensive Assessment System (MCAS) is the statewide standards-based assessment program. The state’s school performance metrics are heavily weighted toward the lowest performing students in the district, particularly by subgroup. The largest subgroups in Lawrence Public Schools are English learners and former English learners. Under the latest accountability metrics, the state has focused attention on the lowest performing students, those found in the warning category, because they are in danger of chronically underperforming and ultimately not graduating. It’s generally recognized by the state and districts themselves that students scoring in the warning category present the greatest challenge from a curriculum and instructional standpoint. English learners who are identified in a warning category present a double challenge because they are simultaneously in need of reaching proficiency in science as well as the English language. KnowAtom prides itself on being able to support the needs of all learners, including English learners and those in the lowest-performing categories. As a partner to Lawrence Public Schools, we’ve not only seen increases in the number of students scoring advanced and proficient, but we’ve also seen dramatic increases in the number of students moving up from warning, the lowest category. After two years of using KnowAtom, Lawrence Public Schools saw a double-digit decline in the number of Grade 5 and Grade 8 students scoring warning. 10% fewer Grade 5 Lawrence students score warning on 2017 Science MCAS data. 12% fewer Grade 8 Lawrence students score warning on 2017 Science MCAS data. The number of Grade 5 and Grade 8 English learners and former English learners scoring warning dramatically declined after two years of using KnowAtom. In 2017, Lawrence Public Schools had fewer Grade 5 and Grade 8 English learners and ever English learners who scored warning compared to peer districts. KnowAtom is proud of the achievements of our partners at Lawrence Public Schools. We’re confident KnowAtom is the most authentic NGSS-designed resource available. However, teaching to transform and impacting student learning outcomes also requires thoughtful teacher and administrator leadership. The data in this report is early evidence of the impact Lawrence’s teachers and KnowAtom’s resources have on all students, including English learners. It’s only the beginning, and we’re excited to see the full depth of impact this partnership can produce going forward. All data contained in this case study come from the Massachusetts Department of Elementary and Secondary Education, School and District Profiles.